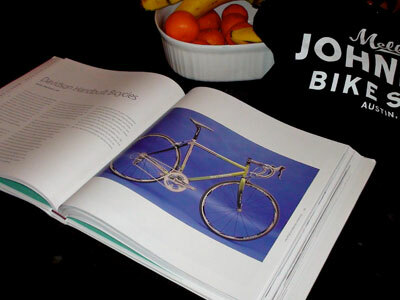 Custom Bicycles A Passionate Pursuit is a coffee-table book that spans the globe with images of custom bicycles. Page 82 features the Bike Hugger Hotspur that was handbuilt by Bill Davidson. The Calfee bullhorn bike is in the book and more from all the builders you know and those maybe you don’t. The book is available for pre-order on Amazon.com. Read more about the Hotspur and the thinking behind the design in this post from Mark V. Also see the Hotspur tag. Previous Previous post: Huggacast 95: Hello Erin, Where’s Mellow, Who’s Lance?